Glenn Currie: "I guess I'm not too concerned about expressing my opinions, ignorant or otherwise, on a panel, so anytime there's a panel, I'm happy to be on that topic." Mike Scioli: "I'm the Robot Group's token biologist." All three panelists were members of Austin's Robot Group. Here is what Glenn Currie has to say about the Robot Group: it's a "non-profit corporation that we set up here in Austin area to build a variety of robots, and we deal with technology and art. Other robot groups you might find across the country are more sharply focused on specific type of mechanical robots, that sort of thing. We take on some pretty big projects, and that's one reason why we set up a non-profit corporation to try to provide some assistance in helping with that." He admits the Robot Group hasn't done much with biological robots, but the panelists certainly have some ideas on this topic they are enthusiastic to share. Linucon 2004 panelist from Robot Group dressed in circuit board. More pictures from Linucon 2004 are in my photo gallery. Why the interest in building robots from biological parts? Glenn Currie. In trying to build mechanical robots, you find pretty quickly that machining steel, aluminum, titanium or stainless steel is a heck of a lot of work, and it can get extremely expensive. So one of the things you take into account with any endeavor is what kind of resources you've got, including money. If you're going to produce multiple copies of stuff, you want to figure out how to it least expensively. Biological systems tend to have schemes already built in for some sort of replication, and you can trigger that mechanism. Glenn. When Watson and Crick came across DNA, they realized pretty quickly that this isn't just a completely linear code. The coding scheme contains codes on how to do certain things, but it also contains metacodes, higher level instructions about how those lower level instructions are to be used. As they decoded parts of the DNA, scientists realized there were unexpected similarities in the metacodes of a wide variety of creatures. For example, the instructions for making an eye are remarkably similar in 20 of variety of organisms. Glenn remembers reading about an experiment several years ago, that took some genes out of a mouse that control eye development and spliced them into the DNA of a fly, into the areas that had to do with making legs and antennae. As a result, eyes -- insect eyes, although non-functional -- were formed on the antennae and legs of the fly. They were looking into, Glenn says, whether this metaprogram on how to make eyes is pretty common among all creatures, not just mammals, but insects as well? How much similarity is there in metaprograms in the DNAs of widely different creatures? There are many examples to illustrate this what Glenn calls "a meta-view of DNA, where you're not just building a particular type of cell, you're building whole systems -- a hand, or an arm, or whatever". The panelists and audience recall a recent (recent in October 2004, that is) news story about a German man with mouth cancer, whose jaw bone, removed as part of mouth cancer treatment, was regrown in his own body. Scientists created a metal framework, implanted it in the guy's back and induced the bone to grow on this metal framework, then transplanted the resulting jaw bone into his face. This story causes Mike to remember the famous mouse that was growing a human ear on its back, presumably as a surgical replacement for a human being whose ear was severed. Mike. If you take pieces of gum from embryonic mice and transplant them into the gums of embryonic chicken, and chickens, we know, don't have teeth -- they begin to grow teeth. And if you transplant the opposite way, you end up with little ridges that don't quite look like teeth. It's not one damn thing over the other, it's the same damn thing over and over again. It's the same patterns are gonna be found in organisms that are reasonably closely related in some line of descent. Glenn reiterates what he considers the most worthwhile aspect of building systems from biological parts: the possibility of rapid development that one can do without having to know all of how DNA works. Rapid, as in, for example, 8 weeks, which is how long it took to grow the jaw in the man's back. "If you have the base material, and you can trigger the replication pattern, you can get it building in 6 to 8 weeks..." -- Glenn says he had seen this timeframe come up in other bioengineering stories he has read, although he doesn't give more examples. Even more importantly, you can do it "without having to know all of how DNA works and how everything relates. You can take big chunks of this stuff, and start making pieces and parts. If you compare the time, the expense and all involved, you're starting out with a lot of really neat parts that you can make, biological parts that are available. Whereas when you go into a shop, you're cutting stuff out of metal and titanium of any complexity, anything like an arm or a hand or anything like that, the amount of time involved is just huge, that makes it very expensive." Glenn. "The basic technology is there, and the good part and the bad part is, you don't really have to understand everything that's going on. If you understand the key portions of what's going on, you can start doing some of this stuff, and you can end up with, to put it nicely, some real mess. But the idea that you can grow things of considerable complexity with limited knowledge and tools that are available today is a reality." A question from the audience pushes the discussion in a different direction. The question I've got is, why does everybody want to build robots that look like humans? What is that fascination with them? Robots are a reflection of us, aren't they? Or that cockroaches would be much better for cleaning. Glenn. They just seem roll up little dustballs, and you have rows and rows of troops walking out rolling up dustballs into the corners... [Some biological systems] that are very prolific, like, roaches or rats [are that way] because they are extremely successful designs. They just work amazingly well. They are also great generalists. An audience member. They are not very good at turning over on a flat surface. Glenn. Yea, they have a variety of difficulties. He goes on to point out spectacular features of rats. Besides the well-known fact that rats can go without water longer than camels, they are smart enough to be used for tasks like rescuing people from under the rubble, in places where rescue dogs or humans can't reach. They are "not as nice and cuddly as rescue dogs, but a rat with a little location transponder can go into amazing places." As a kid, Glenn had rats and discovered how smart they are. They respond when you call their name. They can lay computer cables if you tie them to their backs. Glenn read about a rat that could run computer cables into hard-to-reach places, guided by taps on the ceiling. The rat "learned that wherever the tap is, as soon as you get to the end, you'll get a snack. It didn't take all that long to teach him." Given all this, there had been some interest in putting microprocessors, little radio receivers on roaches or rats. As well as modeling robots after roaches or rats, depending on the set of tasks a robot is being designed for. Mike. I guess that's part of the question: what job do you want done? Humans walk around between chairs real well, but if you want something that would [crawl into holes] you're loooking at a earthworm, or a snake. If I want something to crawl over rocks, I would probably choose a different model to do that. Glenn once talked with a fellow "who's been in the RC -- remote control -- stuff since the 50s". The fellow was talking about a conference he went to, that had a show displaying servomotors the size of a grain of rice. Glenn. The idea was that you build a whole bunch of them, they have some basic sensor information they can gather, and what you do is you just release a bunch of them. And you expect most of them to get destroyed within some length of time, but you're gonna gather information that whole time. And for the time that they're out there, you've only expended a certain amount of resource for each one. And you get a certain amount of data back in. When the military starts getting valuable stuff out of these sensors, for example, battlefield data, then, Glenn is convinced, they will spend a lot of money on it. A person in the audience asks if any significant developments are still being done in artificial intelligence. Neural networks seemed "hot" once upon a time, but they only got so far. (This was in 2004, long before the recent neural net explosion.) Are people still exploring that area? A panelist answers "sure". Are the panelists aware of any new developments that have happened? Eric Lundquist. We're very good at digital computing, [but] the real world is analog. And the way we program computers today, the way we develop technology and electronics and circuits, operate very differently than biological systems. Neural nets are a digital implementation of what is essentially an analog process, a very big, complex, feedback loop, where you have neurons firing neurons firing neurons. But it's not quite that simple. There are so many electro-chemical processes involved in neuropathways, that I don't know if we really have the technology and tools yet that work along those lines. I think what we are doing is kind of a very crude approximation at this point. Certainly, people are still "growing those technologies", he adds. But they are looking in very limited domains, because computational complexity of intelligence is mind-boggling. A person from the audience. The voice from the audience: Yes, yes. Glenn. I'm signed up to give -- it turns out to be a one-person panel -- a talk tomorrow on a Robot Brain project that I instigated in the Robot Group and got a lot of good help from a lot of people. Basically, I'm trying to figure out how minds and brains work, ultimate biologicals there. You come back to some of the big names that started off the whole AI thing years ago. Most of them are still around. Marvin Minsky is one of the big names. I have a kind of a love-hate relationship with the man's work. Some of its stuff, I think, he just had some stellar ideas, and then I look at other stuff, and I go "Marvin, that can't be right!" And I take some solace in that some of his other colleagues [and Marvin] actually throw rocks at each other all the time (metaphorically -- in an ongoing debate). Minsky's always been high level, coming from very high level AI on down. And I think he still believes in that particular approach. And when we get down there and start getting our feet dirty, or hands dirty, or whatever, in the real world, let's start modeling stuff, cause the real world is just really dirty. From a sensor standpoint, all the data is really dirty. You really have to churn it to pull out useful information. Something like sonars -- you put the [...], you send this ping to get the [data] back: yeah, there is a wall 2 feet away, there is one 5 feet away, there is one back over there, but you're not aimed over there! And you have to process all that [complexity]. Then you have people like Rodney Brooks, who's right there (with Minsky), they just have to walk down the hallway to throw rocks at each other at MIT. His approach is from the ground up; he has done some very interesting work with [insect-like simulations that show the way some of the insect behavior works]. It's one of the things I like to point to people: when you look at these biological systems -- take some sort of wasp, for example -- it's a very small creature, it's biological, it reproduces, finds food, builds a nest, and it flies. It can fly and navigate. It can go find food, and it can find its way back to its nest and land upside down. You look at that and you say: we're gonna figure out how this works. It's got wings, it's got legs. Let's dissect, take a look at the nervous system. And the closest thing to a brain it has is kind of a thickening of nerve cells towards the head, and some eyes. And you realize that this is one way to accomplish particular goals. Are humans laid out the same way, the way their minds work? It could well be very different. Because when you start getting to where you can pretty much almost count the neurons and stuff, one of the things you begin to appreciate very quickly is this absolutely incredible elegance of the integration of mechanical, biological and control system. It's just exquisite. For it to be able to do all this stuff, you go looking for the brain level, and you really can't find the brain. There's neurons in here, but [not anything one would think of as a brain]. And as far as trying to figure out AI, I believe that until somebody says "yes, here I have a holy plastic grail of AI", people are gonna have to research it from a number of directions. And I believe that many of those different areas of research will bear fruit and be useful in their own right, for certain types of solutions. Not everything needs to operate like a wasp. But some of capabilities it has are really pretty striking. [In his 1999 book, "What Remains To Be Discovered", John Maddox, the former editor of "Nature" magazine, pointed out that our understanding about how the brain works is extremely small. Like Eric said], we're biological. We are gooey and wet and it's the way our bodies and cells come together. If you go to a computer, silicon-based system or whatever, you might be able to do some very interesting things with that, but it's gonna be characteristically different, at least on some level, in how it operates. It's one of those things, you know, when your main tool is a hammer, everything looks like a nail. [While a digital brain we've made] on some level might approximate or simulate some sort of biological brain, it can be fundamentally very different in a lot of ways. In some ways it may be superior, [for example], as far as calculating large numbers. We don't do that too well. But we're smart enough to build computers that do. So there are people doing research in a lot of areas, and I find it curious and sometimes distressing that they end up with these different heroes or whoever in different fields, and they manage to sway a lot of the funding one way, and there tend to be fads in research... You think they are scholarly people? No, they're just being kids. They are very smart, they want to figure their stuff out and they think their approach is a good way of being successful. But Minsky thought when he was doing [his research] back in the 50s, [that in 20 years or so we will actually have artificial intelligence]. We need just a little bit more computing power! When we get that computing power, we'll pretty much have it! Well, one of the things we came across in the Robot Brain project, is that we have a bunch of computers donated, but what kind of software do we put on them to really start doing something? You got to have some sort of model to work with, [for example,] biological models. I think one of the quotes that's interesting from Minsky, when talking about biologically based or silicon-based minds or brains or robots, is something to the effect of: "I'm no more interested in machines that can think than in submarines that can swim", or "if machines can think, then submarines can swim". He's trying to point out that a submarine does not propel itself through the water the same way a human or fish does, currently; it uses its propellers. Mechanically it's easier to build them that way. It's still pretty effective. But it's doing it in a fundamentally different way. Glenn gets on the topic of the role of emotions in AI. Glenn. [...] Used to see it in the old Star Trek: here's Spock. He's sharp, he's got no emotion. Yeah, that's the way to do it. And McCoy is always going: nah, nah, emotion is really important. In the AI research, it used to be that they would put together these really complex, really cool logical systems, and you start talking about emotions, and they just kinda look at you: "what"? Now, if you look, it's like: "Emotions, man! That's like the current rage! Yea, yea, yea, have emotions!" And so one of the views from my experience is that humans are emotional creatures capable of limited rational thought. (Another panelist grunts in agreement.) Sometimes they would like to think differently. But if you really track them through the day, what they do, and try to understand, "why did you do that? ", they can come up with some beautiful rationalizations for stuff. "Well, I just wanted to do that." That's what it comes down to a lot. Glenn. It's a classic problem with any robot: the batteries are never good enough. 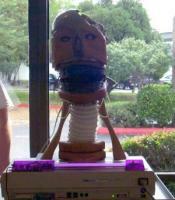 The Babbling Robot Head, a Robot Group project exhibited at Linucon. Babbling isn't quite what it does: most of the time it was heard singing. More pictures from Linucon 2004 are in my photo gallery. Here Glenn finds an opportunity to marvel at how efficiently a human body uses fuel. He first came across this revelation when reading a book called "The Complete Walker IV" [by Colin Fletcher & Chip Rawlins]. Its authors showed how to calculate the optimal amount and composition of food a hiker should carry so as to maximize the amount of calories while minimizing the weight (very important when you are carrying all your belongings, including food, on your back). Glenn. And then the thing that came to my mind after reading this for a while, was "wow, man, human body can do a heck of a lot on a peanut butter sandwich!" It just takes some fuel and manages to convert it and derive an amazing amount of energy out of it. In fact, if you don't get out and move around a little bit, you store some of that energy for later use (laughs). Supposedly for later use, I guess." Mike (apparently addressing someone in the audience). Paul, you heard about DNA computing experiments to solve relatively simple -- not real simple, but relatively simple -- math problems. There's some chemical calculation going on out there. [The reason these] systems are of such interest to me is that [in studying evolution] we use a lot of simulations to understand things that are too complicated to figure out, and in robotics, every time you build something you are really just carrying out another simulation that gives you good information, gives you good feedback: this will work, this won't; why didn't Nature design it this way, what happened to this kind of organism, they were evolved... Yeah, you get some really good feedback biologically from the robots, and I guess robotically from studying more about various organisms that might be of interest. Eric. I've seen robotic herds that looked very much like buffalo herds. And even the robot soccer competitions that are going on -- that's essentially a specialized kind of herding behavior, and I think we can learn a whole lot about how that really has to happen, what are the mechanisms involved when you have these separate distinct entities, and yet they act as a whole. Glenn. Eric correctly pointed out that the world is analog out there. You get reminders of that pretty regularly if you work with digital [devices] and try to interface with the real world. [People have been trying to do that by] going faster and faster digitally, so they can sample and simulate analog behavior and approximate it. But there was a time when they used analog computers on a whole variety of things. Those have kind of fallen into disfavor, but I think you can do -- I know that you can do -- some forms of analog computing essentially chemically based. And I really believe it's another way to solve particular problems: if there's some sharp people pursuing that, and they got some funding and all, I'm confident they can do some things. Because... if you take a look, at a good, say, NFL quarterback, and there's a receiver going out, and he's avoiding all the rushers coming in, and he throws the football, and a good quarterback can just drop it within a 1 foot x 1 foot area, 40, 50, 60 yards down field. First, the engineers start: that's a hell of a differential equation, you have to figure all that out. And you're going: man, the dude is effectively solving that in his head, but he's doing it somehow differently than doing this explicit differential equation. [The differential equation is just] one way to model it. But he's doing it realtime and taking all the information that's coming in, and he's solving that problem. You could model it mathematically, but that's not how it's being solved in his head. [In situations like these] our brains are doing stuff that we don't even have an inkling of. Another Robot Group project that was shown at Linucon, Robot Glove. More pictures from Linucon 2004 are in my photo gallery. Someone from the audience. Or even something as simple as walking. The previous panelist. Oh, it is an incredibly complex problem. The previous panelist (laughs). Yes, digitally. Actually, according to this 02/17/2005 Yahoo story on robots learning to walk like toddlers, significant progress has been made in solving robot walking problem. And here is a NYTimes story on robot-toddler. Glenn. It's a pain. One of the things you come across that might have something to do with bats -- there are way too many interesting projects to pursue -- is that people who are blind still have a visual cortex. And it's an incredible piece of computing machinery. And they make use of it. It's not the traditional use that a sighted person does, but they make use of it. It's just a hell of a piece of equipment. And exactly what it's doing, how it's plastic enough to shape itself to be used in other ways -- it's just another whole area where there is very little information on. But it's an incredible piece of equipment, and it's doing something for people that don't have sight. I don't know [about] bats, since they're not supposed to have a particularly good regular eyesight, but [they may be using their visual cortex to process sonar input]. The discussion ambles back to robot locomotion. Eric. MIT has got a big locomotion lab [...]. Glenn. That's Marc Raibert, I think that's where he's at. [...] Marc Raibert started out with a Pogo stick balancing itself, and went to a couple of legs, and got to where it would jump and do flips and stuff like that, and spin. Probably the vast majority of his professional career was just trying to figure out, you know, how legs are used. It's complicated. It really is. A subthread that runs throughout the panel is a lamentation that most of the financing for robotics research is done by the military or for the military. Glenn pokes fun at the concept of robot wars: "So you spend all this money for all this stuff, and it's gonna bash each other to pieces! How many steps outside the cave door have we made now?" (Panelists and audience snicker.) "But the military's got money," he adds. A humorous discussion ensues about how the Robot Group would have to come up with their research version for Homeland Security in order to get funding. One of the sources of robotics funding used to be movie studios, but not anymore. Robots in the movies were replaced by CGI. Healthcare industry has some interest in robotics, but so far it's limited. "The real biggie", Glenn says, "is defense-related stuff". A panelist or an audience member interjects: And an occasional crazy millionaire. Another panelist. Yeah, a guy came by our shop, spent 15,000 dollars on his battlebot and didn't make it to the TV round. It got wrecked in the preliminary round. Brought back 15,000 dollars worth of trash. Glenn. One of the things that's always interesting to step back from and say, OK, step back and say you got a camera on all these people that are building the battlebots. What can we learn from them? What motivates them? What are they trying to build, what are their goals and stuff? And you look at it and go, like, well, maybe that's why the defense people have all the money for their projects. (Panelists and audience laugh.) It seems to be an easier sell than a lot of other stuff, you know? It's like, well, I would like to build nice cuddly robots for little kids. And they're like, ummm, I don't know. [Then you say] "I'd really like to go after bad people and launch their DNA into the Sun." And they go: "Yeah, how much do you need for that?" (Panelists and audience laugh.) "I mean, just for the initial test? A prototype? Would 10 million be enough to get started?" So anyway, part of the idea [of] biologically-based robots is the considerations of people who have fears, legitimate or otherwise, about pursuing that. The biological research is going to happen one way or another. To the extent it could be guided in some hopefully useful direction, is a wish for most people. But I really believe that you could build exquisite mechanicals biologically much more quickly, particularly after you have focused on that for, say, 10 or 20 years, biologically, than you could by just building a machine shop, cutting up metal and that kind of stuff. Cause you have such an incredibly rich library to work with. What do you want, you want it upright, or on six legs, whatever? We got the pieces. We got a 6-foot long cockroach, [...] it could be used. What else do you wanna built on it? We got a chassis ready to go.